Inducted 2000. Linebacker at QND, Illinois Wesleyan. Class of 1980. Before going on to a record-setting career as a football player at Illinois Wesleyan University, Obert, a 1980 graduate, was an outstanding linebacker at Notre Dame. Obert won two varsity letters in both football and baseball, but it was on the gridiron where he made his mark. 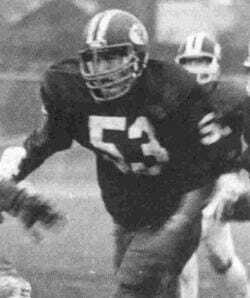 He was named the team’s most valuable defensive player and led the Raiders in tackles as a senior in 1979, and he was named to the Quincy Herald-Whig’s All-Area team. At Illinois Wesleyan, he started every game in his sophomore, junior and senior years. He led the team in tackles in each season. His 101 tackles as a sophomore in 1981 ranks 13th on the IWU all-time list, his 134 tackles as a junor ranks 3rd on the all-time list, and his 140 tackles as a senior in 1983 still stands as the school record. He recorded 30 tackles in one game as a senior against eventual NCAA Division III national champion Augustana, a school mark that still stands. As a junior, Obert was named to the NAIA All-District 20 team, the all-CCIW (Collegiate Conference of Illinois and Wisconsin) team and was his team’s most valuable defensive player. He earned honorable mention on the Mid West All-Academic team and was named to the Phi Gamma Delta All-American team. Obert kept piling up the honors as a senior. He was named to the GTE Division III All-American team, the Phi Gamma Delta All-American team and to the District IV College Division All-American team, which consisted of players from six states. He was twice named the CCIW player of the week and was again named to the all-CCIW team. Obert and his wife Michelle live in Quincy, and they have six children – Brittany, Meredith, Hilary, Claire, Connor and Ericka. He is employed as an accounting manager by Dot Foods in Mount Sterling.